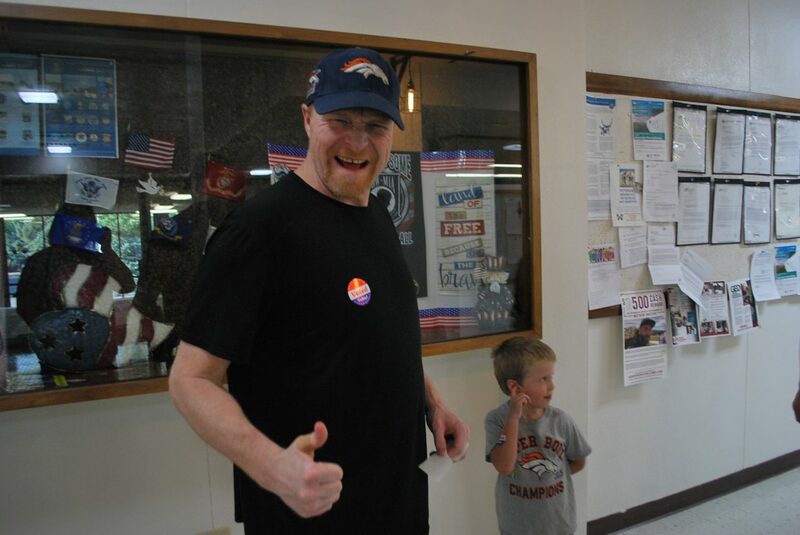 County resident Kelly Mosman gives a big thumbs-up after voting while his son looks ready to go home. CRAIG — The unofficial results are in, and Moffat County Republican voters have selected Donald Broom as their candidate for the general election in November. In the three-way race for Republican candidate for District 3 Moffat County commissioner, incumbent Frank Moe received 18.48 percent of the vote, trailing to both his challengers — Broom, who captured 49.64 percent of the vote, and former commissioner Tom Mathers, who garnered 31.88 percent. As there are no Democratic candidates for the seat, in winning the primary, Broom — barring a last-minute unaffiliated challenger certified through petition or write-in — secured his place as Moffat County’s next county commissioner for District 3. 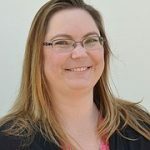 In the Republican race for Moffat County Clerk and Recorder, Tammy Raschke’s 27 years of experience in the office earned her 62.82 percent of the vote, according to the unofficial tally, compared to Tori Pingley’s 37.18 percent. Like the county commissioners race, the contest for county clerk and recorder drew no Democratic candidates, meaning Raschke has — again, barring a petition or write-in challenge — won the office. In a close race for the Republican candidate for county coroner, unofficial results show 50.62 percent of voters chose Jesse Arthurs compared to 49.38 percent, who opted for incumbent Coroner Kirk McKey. Arthurs will face Democratic county coroner candidate Alec Brown in the November general election. “This race is close enough that the official results could trigger an automatic recount. The race has to be within a half a percent to trigger a recount,” said Chief Deputy Amanda Tomlinson. In uncontested races, Republican incumbents for treasurer, sheriff, assessor and surveyor were given a strong show of support. See the fact box accompanying this story for a complete list. County resident Kelly Mosman was feeling good about the election, as he and his son were among the last to stop by the courthouse and vote just before polls closed. “The county is in chaos. People who complain need to vote. As a veteran with the U.S. Navy, I know how important it is to vote. Even if you don’t win, at least you are telling people how you feel,” Mosman said. Primary turnout was higher than expected, with 3,352 people voting. A new law this year allowed Colorado’s unaffiliated voters to participate in the primary for the first time. “It was lower than expected,” Tomlinson said. Colorado Secretary of State Wayne Williams said that just over 1 million Coloradans had returned ballots for the primary election just before polls closed. Of that total, 411,578 ballots were cast by Democrats, 380,974 by Republicans and 251,133 by unaffiliated voters. The ballot returns do not include in-person voting, and Williams expected to have complete numbers late Wednesday. Moffat County voters also helped choose candidates for federal and state offices.